It’s official. Businesswoman Lynn Netzler is a legitimate holder of the Matai’a chiefly title at Vaitele. Yesterday, Matai’a’s family and the village of Vaitele marked the occasion with a grand ceremony. Mata’ia Lynn is heir of the (Sa) Matai’a family of the Uilaefa clan. The initial bestowal ceremony was held close to ten years ago but the family’s decision was challenged in Court. The title later became the subject of a Land and Titles Court hearing between Vaimoso and Vaitele. The Court ruled in favour of Vaitele. Flanked by families, friends and hundreds of people in attendance, Matai’a Lynn, said the journey has been challenging but she can only look to the future with optimism. The 70-year-old mother received the blessings from her family and the Village Council as she embarks on another leg of her journey. “I feel very honoured, very privileged,” Mata’ia told the Sunday Samoan. Matai’a does not want to dwell in the past. “What’s important to me today is that I am very happy to see that all of my families are here to celebrate this special day with me,” she said. She expects the road ahead will not be without tests and challenges. “Yes, there are challenges along the way but with God nothing is impossible,” she said. 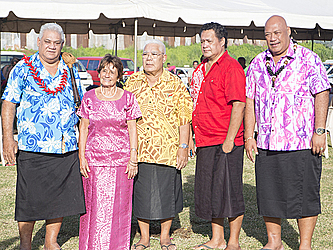 Mata’ia, who is a prominent businesswoman, is a mother of six children with her husband, the late Toa Netzler. The ceremony started with a church service, followed by the blessing of the title by the chiefs of the village. Traditional formalities followed.